CineMagic’s Riverfront Studios will be located in the big red building with the brand-new windows. Yesterday I mentioned that 420 Kent Avenue (part of the former Kedem Winery site) was undergoing a major rehab (something a bit more than the “interior renovation of storage garage” described on the Alt-2 application). My information was correct – the property is being converted into a massive soundstage facility for movie and video production. 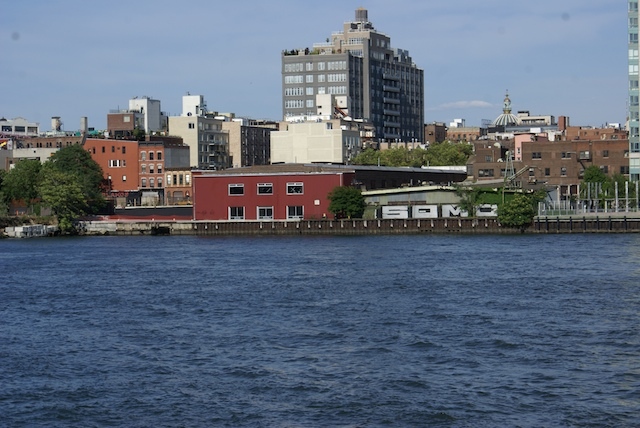 According to a listing of production facilities put together by the citystate, CineMagic’s Riverfront Studios at 420 Kent Avenue will include five stages (River Stage, Schaefer Stage, Rooftop Stage, Skyline Stage and Daylight Stage) totaling more than 60,000 square feet. The people behind this operation already operate a small stage on Elizabeth Street in Soho (the website for the Williamsburg facility isn’t live yet). Given the investment required to put together a major facility like this (which I assume CineMagic wouldn’t do without some sort of long-term lease), I’m betting that owner Rector Hylan has no imminent plans to build residential here.